Summary: The intent of this project is to renovate The Turtle Hospital's Welcome and Education Center with the aim of improving the educational value of the displays, updating the Center to reflect a higher degree of professionalism and modernization, and addressing the modest repairs and renovation needs of the facility. The current educational displays are rapidly depreciating, unorganized, and in disrepair. The Education and Welcome Center remodeling project will consist of custom designed educational displays, a video kiosk for informative video presentations, new drywall and paint, ceramic tile flooring, appropriate lighting, and custom cabinetry that includes a new center island. These upgrades will establish a highly effective learning center that will help better educate the public on sea turtle issues. 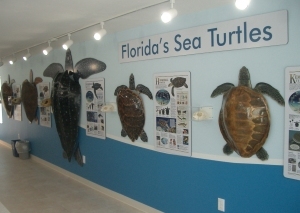 Results: With funding from the Sea Turtle License Plate Grant, The Turtle Hospital has transformed the former center into a museum quality public education center for sea turtle conservation. The project was a large scale project that included replacing walls, displays, A/V components, cabinetry, and lighting. The Turtle Hospital has received rave reviews for its new Education Center from friends of the hospital and the general public. With a complete and professional appearance, the new Turtle Hospital Education Center will help to establish a highly effective learning center that helps better educate the public on sea turtle issues.